After centuries of conflict, one might think that the Scottish Borders would be strewn with castles and fortifications. 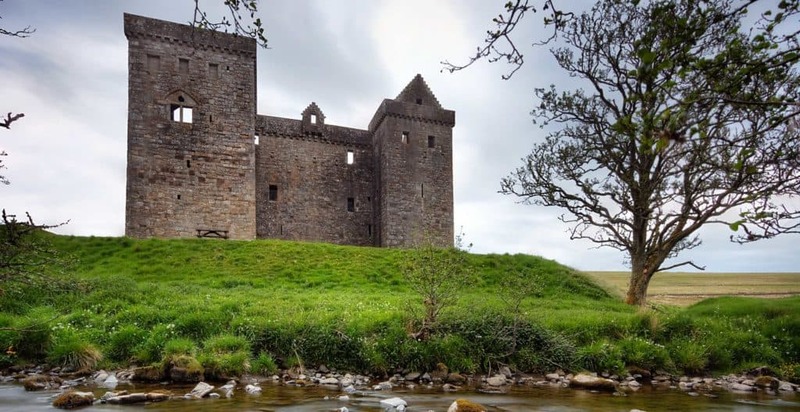 Although this is true for the southern stretches of Dumfries and Galloway, the eastern borders are surprisingly void of castles with only four lying between Peebles and England. Battlefield sites however are in plentiful supply, from the Battle of Halidon Hill in 1333 to the much later Battle of Philiphaugh of 1645. The most famous of all though is the Battle of Flodden, the battle which saw the death of most of the Scottish nobility as well as King James IV. The Scottish Borders also have some fabulous Roman remains which date back to their failed attempt to conquer Scotland. Dere Street for example was the main supply route between Hadrian’s Wall and the Antonine Wall, and some milestones still remain to this day. Along this route are the camps at Pennymuir and Trimontium, although due to the transient nature of the Roman occupation most of these camps were temporary and now only earthworks remain. If visiting the Scottish Borders then we highly recommend a trip to the Eastern coast which boasts some of the finest beaches in the whole country. Even better, due to their relative isolation they’re often deserted even in the summer months!